Palm's Treo Pro (£399 inc. VAT or free on contract) is a Windows Mobile handset aimed at the corporate user. It's similar in style to the company's smaller Treo Centro, but is packed with features. The phone is wide and tall, but a depth of just under 14mm helps it to ﬁt easily into the hand. The glossy design adds a touch of style, but it's also a magnet for ﬁngerprints and scratches. You'll ﬁnd a square 2.4-inch touchscreen display that's bright and colourful. It's not as large as those on some rivals, but the 320 x 320 pixel resolution makes it an adept solution for viewing webpages and emails on the move. A series of buttons below the display offer an alternate way of navigation. We also liked the keys around the edge of the phone that let you easily mute the sound, or turn off all the wireless functions without going through any menus. Frustratingly, while the power button on the top may turn off all the radios, it won't turn the handset off completely. There's a full QWERTY keypad, but it doesn't stretch right to the very edge of the handset and the keys are slightly squashed together. It's still easy to type at speed, however, with the keys proving highly responsive. One of the Treo Pro's most impressive aspects is the connectivity it offers, with 3G/HSDPA, Wi-Fi and Bluetooth all built in. We found websites loaded quickly when out and about, and we had no trouble connecting to wireless networks. As with an increasing number of rival handsets, a GPS chip is integrated. Google Maps is pre-installed, letting you ﬁnd your way around unknown areas, and there's a 30-day trial version of Webraska's sat-nav software pre-installed. 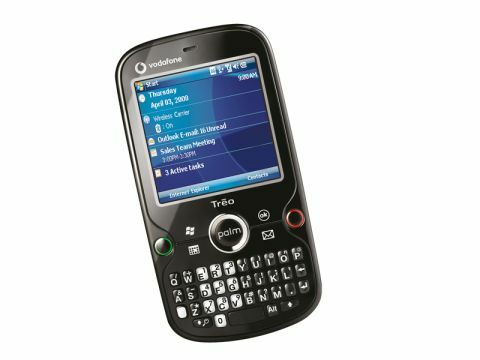 The Treo Pro is the ﬁrst Windows Mobile device we've seen to come without an ActiveSync CD. You'll still have to use the software – but you'll also need an internet connection in order to download it. Palm was keen to point out this was part of an attempt to make the phone's packaging more environmentally friendly, with recycled materials also used. The Windows Mobile OS makes it easy to set up your email accounts, with support for Microsoft's Exchange server and Push Email. You'll ﬁnd a full complement of Ofﬁce Mobile applications provided, so it's easy to edit your documents when out of the ofﬁce. You'll also be able to transfer them easily, via Micro SD card, with up to 32GB cards supported. The Palm Treo Pro may not offer anything revolutionary, but it is a very good phone. It's easy to use, comfortable and packed with features, and is an impressive all-rounder.